Signature : Mumei attributed as Sue Tegai. Blade length : 67.8 cm or 26.69 inches. Width at the hamachi : 2.62cm or 1.31 inches. Width at the Kissaki : 1.91cm or 0.75 inches. Era : Middle Muromachi period. Shape : Oosuriage mumei . the blade is regular width, thickness with small sori and longer kissaki. about 15 cm from the monouchi area, small Fukure appear. There is a Kitae-Ware near the Habaki. Hamon :niedeki suguha hamon with small kinsuji. and Hakikake. 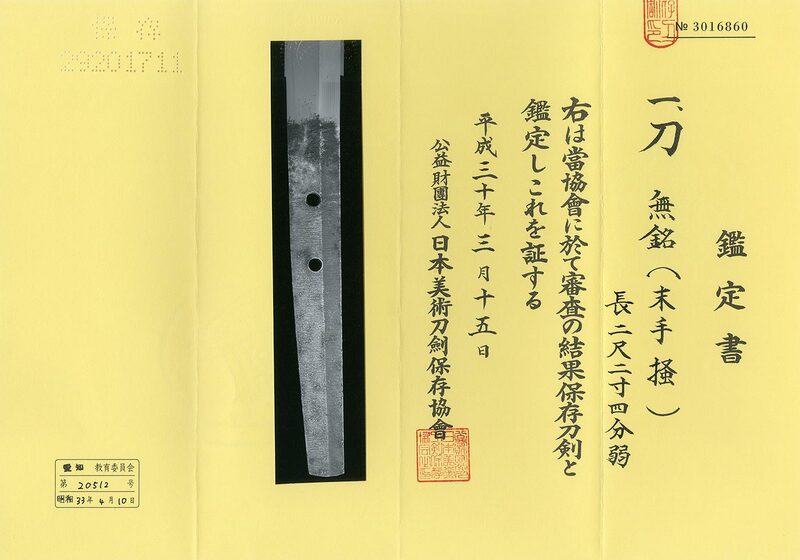 the blade looks early Muromachi period Sue tegai sword. Tegai school started Kamakura period to Edo period. According to the reputation,Suguha hamon cut well. This sword has a lot of activities in Ha, so you will enjoy a lot. to Shinto period for a long period. Tsuba :On the round shape thick iron Tsuba which is called To-Syo Tsuba. Menuki : Gourd is engraved. Kojiri: Iron, arabesque is engarved with gold color.